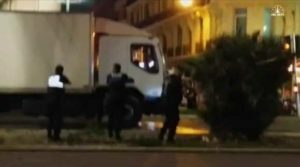 NICE, France (NBC News) — The death toll continued to climb Friday as forensics teams combed the scene where a truck driver mowed down dozens of revelers after a fireworks display at the French seaside. Police told NBC News that 84 people were now confirmed dead following the attack in the coastal city of Nice. Bastille Day celebrations were transformed into scenes of chaos and carnage after the white vehicle careered down the packed promenade.